Manuel Neuer (l.) and Robert Lewandwoski (r.) were key to FC Bayern München's Bundesliga title triumph in 2016/17. FC Bayern München pair Robert Lewandowski and Manuel Neuer have been named on the 23-man shortlist for the Best FIFA Men's Player award... and you can vote for them! The Bayern pair have combined for 156 Official Fantasy Bundesliga points so far this season. Get them in your squad now! 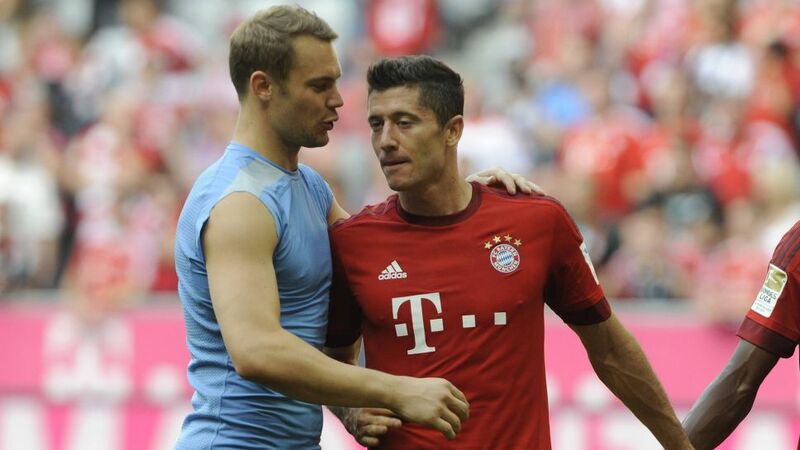 Lewandowski and Neuer have been cornerstones of Bayern's recent successes. bundesliga.com takes a closer look at what won their place on the shortlist for 2016 - the first year of world football's governing body's rebranded accolade. Lewandowski has already hit the ground running in 2016/17, with his seven goals in seven games helping the Bavarians to the top of the league and the Poland captain to bundesliga.com's October Player of the Month title. His form is little surprise. The 28-year-old won the Törjagerkanone last term, plundering 30 league goals to help Bayern to an unprecedented fourth consecutive Bundesliga title. He scored five goals in nine minutes against VfL Woflsburg, picking up four Guinness World Records in the process, and ended the campaign with a total of 42 strikes in 51 matches for Bayern in all competitions. Select Lewy and Neuer as Best FIFA Men's Player by clicking right here! Neuer has already kept five clean sheets in the Bundesliga this season, and Bayern's successes last term were underpinned by equally miserly defensive displays. Neuer featured in all 34 games in Bayern's title triumph, keeping no fewer than 21 clean sheets in that time - a Bundesliga record. The 30-year-old also lifted the DFB Cup and German Supercup, and capped of the season as the Germany captain to boot, with former Bayern teammate Bastian Schweinsteiger retiring from the national team. Click here for more FC Bayern München club news! Aubameyang, Vidal and Müller joined Lewy and Neuer on the recent Ballon d'Or shortlist. Read more!